Flickr user hala065 brings us these otherworldly images of a beach in the Maldives that glows with millions of pinpoints of glowing blue. The light from these bioluminescent phytoplankton looks like a fantastic starry sky somewhere deep in the universe. It's mesmerizing. 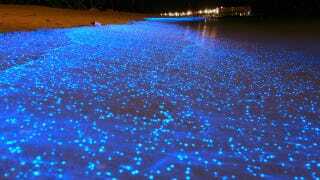 First spotted by Colossal, these phenomenal photographs show how the glowing phytoplankton light the entire beach where the waves hit the sand and agitate the little creatures. They also light up under pressure, like when people walk across the sand. Imagine how beautiful, how breathtaking, a beach like this must look in person. If you lived here, you'd make a long walk on the beach a nightly activity.